Last week, two baby birds fell out of their nest from under the eaves of our house. They didn’t seem hurt, so the kids and I got online and researched what to do. It turned out to be quite the project. In an effort to try to get the mama bird to come back and feed her babies (the nest was too high for us to put the birds back in), we made a “pretend” nest out of a basket and hung it from the swing set. I explained to my kids that we couldn’t keep the birds as pets, but that didn’t stop them from looking for bugs to feed the babies until the mom bird returned. Which thankfully, she finally did. The whole thing was all very exciting. My son even asked if he could write about it, so he could send an email to his friends. Today, I had a friend over and we noticed that a babby bird fell out of the bird nest from the top of our house. I asked my mom to look up how to care for birds and it said to feed them every 15-20 min. or they will die. We made a nest for the bird and took care of it. After that I went outside to check on it and I found another one. I was scared it had a Brocken legg. So I figgerd how to pick him up without herting him. I put them both in a basket, then I went to go find some food for them. Well that worked for acopple of ours but after that all of the slugs and snales went into the boushes so we coulden’t feed the birds. But it was alrite because my sister saw the mom feed them for the first time. And the ether one didnt rilly have a broken legg. But we still have to feed it because the mom bird only comes every 40 min. so it works out great! It gives us anouf time todo some work, laze around, and have some fun. I’m not kidding when I say my kids spent an entire day in the backyard watching those birds, working and “lazing” and having fun. They set a timer every twenty minutes to check on the babies. They dug tirelessly for slugs and worms. They hid quietly and watched, waiting for the mama bird to come back. They named the birds Chuckles and Tibbles. Unfortunately, though–we think because it got a little cold at night–the birds didn’t make it. Well it terns out one of the birds got to cold and passed away at night. Then the ether one past away. But it was a privilege to take care of 2 of Gods birds! I love getting a peek at my kids’ perspectives like that. And I have to tell you, the privilege was actually all mine. Because it was a pretty cool thing to watch my kids give of themselves and genuinely care for another living creature. I've heard so many baby bird stories this year – so far none of them have turned out well for the birds. The people however, have had their heart enlarge two sizes :) What a great adventure and teaching adventure for your kids. Awwww, that is SO sweet!!! I'm sorry the mom didn't come back. :-( Your kids handled it well. They sound wonderful! Very touching. You are doing a great job with your children. And may I add I love to read children's writing spelled phonetically? Cracks me up! Oh, that just brought tears to my eyes – how sweet! Such a great story and lesson. Love his account of it all.Thanks for sharing, and thanks for popping over to my N Ireland blog to say "hi". Hi Genny! Thanks for stopping by my blog. What sweet children you have. How compassionate and kind to care for those baby birds all day. Adorable story! SO glad you're back in the blog world! Oh, Boy…did this story bring back memories for me. I can't tell you how many baby birds we have "tried to save" over the years. Only once did it work out for the bird. We called him Jassie; a homeless Starling that had found himself cold, wet, and quite without a mommy in the parking lot of our apartment building.He was in decent shape so we brought him in and asked a bird expert what (and how) to feed him. 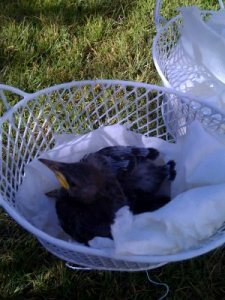 We kept thinking he was going to die, but, to our surprise, he lived!We decided to keep him as his upbringing in captivity rendered him a little out of the wild bird loop. What a wonderful pet he turned out to be. He sang, mocked us, and genuinely entertained my children for years before he eventually died of some type of birdy pnuemonia. RIP Jassie bird; we will always miss you. Thanks for visiting today.I enjoyed your story, the teacher in me loves the way you turned it into a fabulous learning experience for the kids. How sweet for your son to appreciate being able to care for God's birds. So sweet. Awwww–I hate that they didn't make it, but what an amazing experience for your kids–love his writings on the journey–Blessings! WOW! What a lesson for your kids. Clearly, they have inherited your caring heart!! What a sweet story, and very touching lesson, for all of you. Thank you for sharing it. So sweet~Happy 4th my friend! That is precious. I remember doing this sort of thing when I was a little girl.I think it's wonderful when you get a glimpse of that side of your children. Your son appears to have a very tender heart and that is so admirable. The strongest and most noble men I know are also ones with very gentle and compassionate spirits (my husband is one such man). Oh, that is sweet. So sad. :( We are having another animal funeral this week, too for the hermit crab.